Lead And Nickel Free! 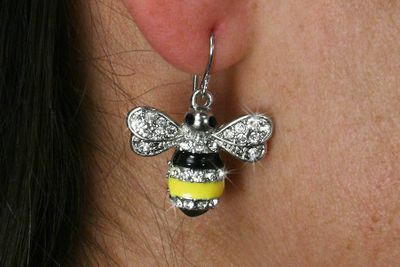 Cute Silver Tone Fishhook Earrings Feature A Yellow And Black Bumble Bee Accented With Clear Faceted Stones. The Eyes Are Onyx Black Faceted Crystals. These Earrings Are For Pierced Ears. Earrings Measure 1 1/4" Long.